NEW YORK — MTV’s reality series, Real World, kicked off its 21st season this year with a move to Brooklyn and an eco-friendly facelift by production designer Ellen Waggett of Vibrant Design, LLC. The third person to design the show during its two-decade run, Waggett has a wide range of film and broadcast television credits. Waggett was production designer on ABC’s Hope & Faith from 2004 to 2006, art director on the first season of FX’s Damages, and won an Emmy Award nomination for Outstanding Art Direction in 2004 for her work on the NBC series Whoopi. She also served as production designer on Stephen Colbert’s A Colbert Christmas, as well as Chopped, Worst Cook and Food Detectives for the Food Network and Tim Gunn’s Guide to Style season two. She recently also co–designed NBC’s new show Late Night with Jimmy Fallon. For Real World: Brooklyn, Waggett came up with the loft that served as a home for the show’s participants, transforming an old warehouse on Pier 41 in Brooklyn’s Red Hook district. Based in Brooklyn herself, Waggett sourced most of the flat’s furnishings and decorative objects locally and recycled much of the décor back into the neighborhood. Waggett was hired a year ago to design the initial space the production had committed to, in downtown Brooklyn. Just as construction began on the first space, a different property on the East River, with views of the Statue of Liberty, the Staten Island Ferry’s route and the Verrazano Bridge, was discovered, and the production was quickly moved. Waggett began by landscaping the pierside site and planning “a grand arrival” for viewers with visual surprises around every corner. “I love thinking about the impression people get when they enter a space,” she said. Waggett fenced off the entire pier and built out the dock and a small private beach, and added exterior steps. The exterior of the building was treated with a variety of hand painted murals. 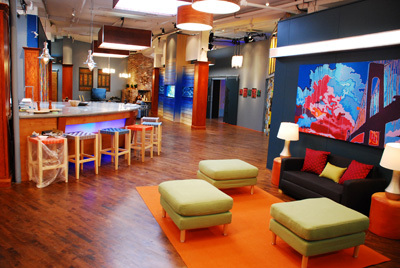 A huge staircase leads to the apartment’s anteroom where enormous sliding doors open onto a hallway filled with bold art and the show’s signature fish tank. Visitors walk around the aquarium to start exploring the rest of the flat’s generously proportioned rooms. She selected a variety Brooklyn-based artists and artisans who had already begun designing custom pieces when the location was changed. “We had to take pieces we had already fallen in love with and repurpose them in the new space,” says Waggett. “Fortunately, they worked beautifully in the new apartment.” About half of the furniture was custom made from renewable materials; the rest was repurposed from flea markets and other shops. The result, she said, was “a very colorful, very urban explosion of ideas. I have a very colorful aesthetic and the apartment reflects that. I like happenstance — what accidentally happens when you combine things, and they suddenly look magical. As long as I choose things I feel passionately about, I know they may initially look like they will not work together at all, but when you get into the space, they’re great together! In this case, we had so many wonderful fine artists working with us, so I got to select all this amazing art that I loved…. And then watch it all sparkle and pop in a whole new way once it was all hung together in this way!” Waggett opted for sophisticated slate-gray walls in the common spaces that make the contemporary artworks pop. Waggett named each bedroom for a Brooklyn landmark/neighborhood. She selected bold vertical stripes for the Coney Island bedroom; the Grand Army Plaza bedroom was based on custom-designed furniture by Wonk, traffic symbol sheets by Dwell and an emerald green wall; the peaceful Promenade Bedroom displayed a much more refined and elegant side of the house, with its black and white photographs, silver sconces, and Damask bed linens. The office, with a computer powered by a bicycle-operated generator, sports a “beaded curtain” archway made from old wallpaper sample books, and a large sculptural painting by Craig Anthony Miller, made from an old car hood. For more information, please visit www.vibrantdesign.tv.